Sarah & I playing "Swat the vocab" with our 10th Grade Class. With only 10 students, it is the smallest class we teach in Kyinka and an excellent opportunity to work one-on-one with each student. Last week was our first week of teaching!! Surprisingly, we managed to get by without any major debacles despite our whole cluster (except me) battling a case of the flu. So far, our cluster partner teachers five classes a week: 5th grade twice a week, 6th grade, 8th grade and 10th grade. I am amazed by how much the students’ English ability and maturity level drastically changes from the 5th grade to 10th grade. Lauren and Larry essentially have to entertain the 5th graders and do everything they can to teach them English with managing their endless energy. Whereas, Sarah and I have to do everything we can to energize our 10th graders and make them understand they need English to graduate from University in two years. The hardest part about planning the lessons is accommodating these drastically different ability levels in the same classroom. Unlike my high school in the states, all academic levels in each grade are in the same class. That means we can have normal speed conversation with some students while others don’t even understand ‘hello’ and ‘goodbye’. 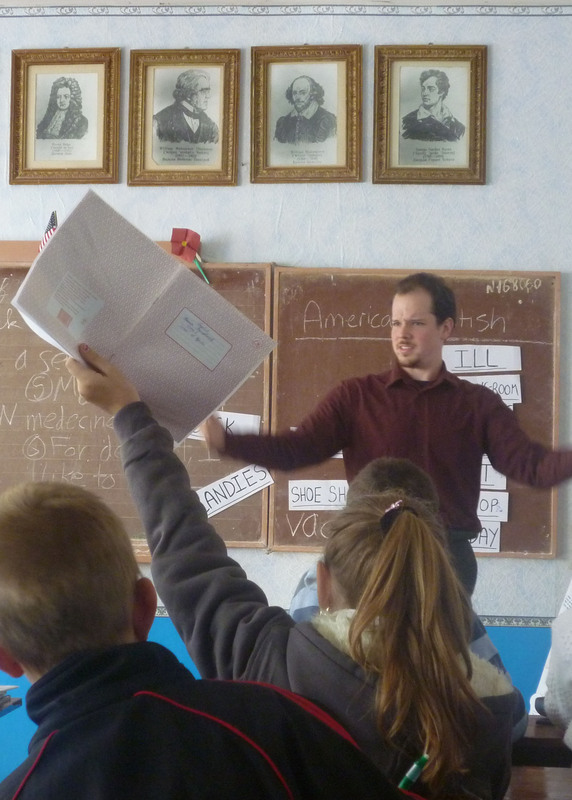 Since Ukrainian teachers are determined to be good teachers or bad teachers by how much their students lean, we have been told most teachers simply pay no attention to the students who are slow and don’t put forth academic interest. We have been told to forget about them and understand that they have no interest in pursuing an academic career, and that is okay because the country needs bricklayers and plumbers as much as they need University graduates. Tomorrow my cluster and I are visiting Kiev, the capital of Ukraine! It will be a 2 hour bus ride each way, but I am very excited! It’s really interesting to hear about schools in Ukraine! Sounds like you’re doing good work! I play the vocab swat game with my kids sometimes too! Also, does the Ukranian lesson plan ever call for a review of previous material? Or do you just present/practice/apply new material every day? I so happy you read this post, Kristen (and Hui)! I was going to email you and ask you what you thought of it because you are the only language teacher I know back in the states. I think their lesson plan expects the warm-up/presentation/practice/application to review previous material by using it to frame the new material. I haven’t seen a real emphasis on it though. However, it is only my second week in the classroom, so it is very likely we will learn how to review later in the technical training. We also haven’t focused on when/how to review HW, but I think that will come into play when we make more regular appearances in the school. In the US, are teachers required to have a lesson plan with then at all times? If so, is the lesson plan as strictly organized as the Ukrainian one I described? How do you review previous material in your clases? P.S. Swat is awesome and the kids go crazy for it! US Teachers, at least all the ones I know, are not required by law to carry a lesson plan on them at all times. Some schools require the teachers to turn in lesson plans every week to the principal… my school is not one of those. Hui’s is I think though…. Even then, some schools have a specific lesson plan format that you must follow while others just want to see some proof that you are planning before you teach. I’m actually surprised that my school doesn’t require lesson plans, but I’m not complaining 🙂 I still do the lesson plans, just in a way more informal way. There are so many different ways to review in class. Jeopardy is a great way to review content (I have a template if you want me to email it to you). If you’re talking vocab words, I have a giant list of games to play that all practice speaking the language. I’ll send you an email. What email address should I use? Let me know if you have any other questions. I love reading about your teaching experiences! Keep the posts coming! I would Loooooooooove your list of vocab speaking games. I hate doing flashcards over and over again and I want to put a smile on the kids’ faces. Thank you so much!!! My main email now is katherine.axelsen(at)gmail.com. I only know your umich email, so send me your new one too. Jeopardy would be great too. Ahhhh, you are amazing! That is interesting what you say about the lesson plans not being universally required. Sounds much more practical and attainable. Do you know any good books that simply discuss teaching methodologies? I can’t imagine there is only one structure to all this madness. 🙂 Especially for non-language teachers. Are Hui’s lesson plans very different than yours? According to my mom (former high school teacher) in Brazil you are also required to have a lesson plan before classes.